At the end of his visit, Bishop Cornelius of Volgodonsk and Salsk presented gifts to the refugees from Ukraine: basic necessities along with icons of the Don Mother of God. PRAVMIR. On July 25, 2014, Bishop Cornelius, head of the Diocese of Volgodonsk and Salsk, visited the Parish of the Kazan Icon of the Mother of God in the city of Semikarakorsk, which has welcomed more than twenty refugees who have come from the southeastern regions of Ukraine. During their meeting with the bishop, the refugees thanked the head of the Volgodonsk Diocese for his help and warm welcome, the press service of the Volgodonsk Diocese relates. At the end of his visit, Bishop Cornelius of the Volgodonsk and Salsk Diocese presented gifts to the refugees: basic necessities and icons of the Don Mother of God. 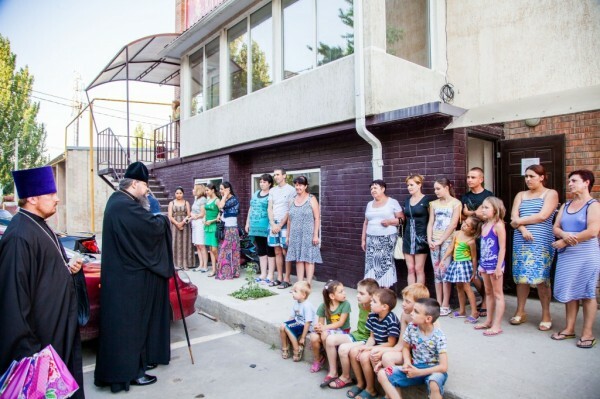 The clergy and parishioners of the Volgodonsk Diocese are doing everything possible so that the forced migrants from Ukraine in Russia receive support for their future.